Photos by Julia Chevlin, except for the one of dylan on his back, which was by Sean Chisham. November 5th. Lilypons, Maryland. 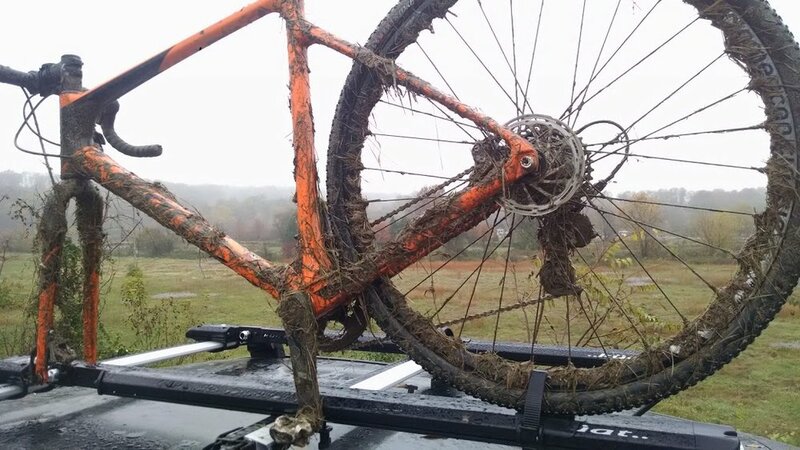 Conditions were unfavorable for any sort of outdoors activity, which means that conditions were perfect for cyclocross. The air was chilly. The rain was extant. The mud was deep, sticky, and -- it would later be revealed -- just absolutely chock full of poison ivy. No matter, as The Great Eskape takes foolhardiness pretty seriously. Our race contingent consisted of myself, a man whose love of cyclocross has caused him to take up road racing, and Sean Murnane, a known marathoner and suspected triathlete. Out of our depth but in our element, or possibly vice versa. The Ed Sander course opens on an extended, paved uphill, before a sharp left downhill, then another right uphill that flattens out in time for some barriers. The course drops left in to a bowl, and then climbs out of it on a steep grade. Naturally, there is a lone barrier in the middle of this steep climb, preventing all but the best bunnyhoppers from riding out without shouldering their bikes. After few off-camber turns and a sandpit, the riders find themselves in the beloved lily ponds section of the course. Here, the race makes several sharp turns around standing garden ponds before wrapping back around to the uphill start. By the 11 am races, the mud was ankle deep in spots, and finding traction was a hopeless cause in the off-camber sections. After a couple warm up laps that probably did more harm than good, Sean and I lined up in a deep and strong field of 48 cat 4s. The eventual winner pulled away early, and would go on to take victory by a minute over 2nd place. I traded spots with some strong riders and kept myself near the top 5 through the first four laps. 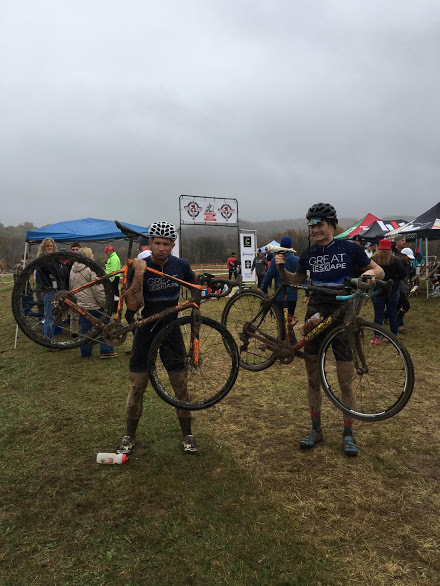 This race was all about finding fast lines through--or around--the mud. I was able to work the edges at a couple spots, and only paid a small price in the form of thorns across my arms and legs. Most of the off camber sections turned to running, or carefully walking with shouldered bikes. 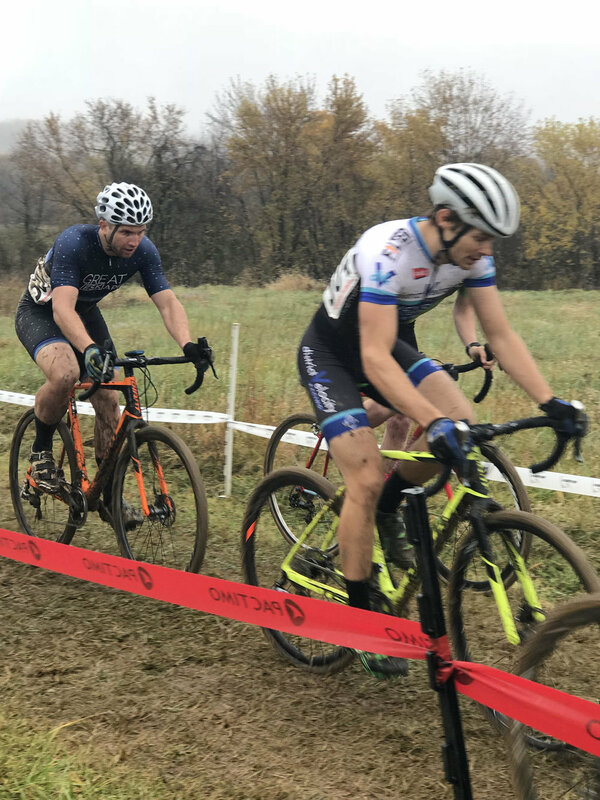 In his first cross race of the season, Murnane kept the rubber side oriented correctly and finished a respectable 34th in a race in which almost a fifth of the entrants DNFed. The judges, in what was clearly a violation of the racers' 8th amendment protections against unusual punishment, let this this race play out extra long. I started my final lap at minute 48, and spent a total of 59:40 on course, doing something approximating racing. Starting the final lap, I found myself in 5th wheel, with 15-20 seconds on the rider chasing me. "Just keep it steady," I said to myself. "The final podium step is yours if you don't do anything too stupid." Immediately, I did something too stupid. Reaching in to my drive train to clear off some grime, I caught a finger of my glove in the chain. This destroys the glove. Also, it sent me careening off in to the tape. Unable to recover on the bike, I was forced to run to the barriers, leaking precious seconds to the strong rider coming up behind me. By the time I cleared the barriers, he was right on my wheel. We kept positions down in to the bowl, and he pulled up next to me as we hoisted our bikes over the uphill barrier. Then disaster struck. While he sailed over the barrier cleanly, I clipped my front wheel, causing a full face plant in to a half a foot of muck. Falling with my bike on my shoulder, I took a saddle to the back of my head, pushing me even further in to the mud. To his immense credit, my fellow racer checked to make sure I was okay, then charged up the hill ahead of me. I collected myself and gave a hard chase around the rest of the lap, but was never able to close that gap, finishing in 6th place, 9 seconds off the bottom step. Crossing the finish line, I dipped under the tape and collapsed. Exhausted from the effort, frustrated by the near-miss, but proud of my performance. MABRA installation Sean Chisham stepped in with some helpful words, "Good job, but you just missed the box. Now let me take a picture." On Tuesday afternoon, a post appeared on the local FB cycling page asking if anyone else had gotten a lot of bug bites at the race. If only we could have gotten out of it so easily. It quickly became clear that almost all of us had gotten poison ivy. The received wisdom is that all the slop contained a healthy amount of ground up poison ivy leaves mixed in with all the other plant matter. I got the rash all over my legs, arms, and back. Other racers I spoke to fared even worse than me. But in giving us something to commiserate over (ed: for the record, I, Andy Karr, have maintained all season there was no way in hell i was doing this race because Lilypons is a literal bog and this course eats drive trains for lunch. I enjoyed my day out on my mountain bike, thankyouverymuch.) for the next few races, Ed Sander 2017 once again showed us how cyclocross brings people together. Nothing unites like a common enemy, and all that. In summary: cyclocross at it's finest. Thanks for a great race, NCVC!